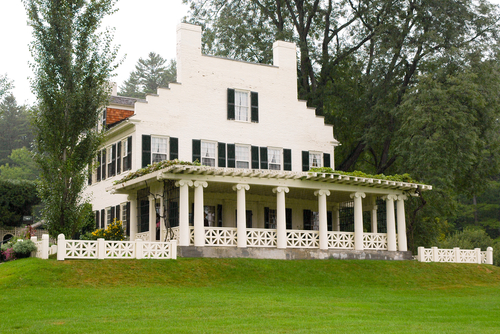 Located just six hours northeast of Fretz RV in Cornish, NH, is a gorgeous area: Saint-Gaudens National Historic Site. Discover the home and studios of one of America’s greatest sculptors here. After Augustus Saint-Gaudens’ death in 1907, his widow, Augusta Saint-Gaudens, created a memorial in his honor. She went to great lengths collecting his art work and displaying them in his studios and around the property to serve as a living memorial to her late husband. When you visit this historic site, you will see over 100 pieces of his artwork displayed proudly. The house has been preserved in much the same way as when Saint-Gaudens and his wife lived here, right down to the original furniture. The main showcase here are his studios on the property. You can partake in a 20-minute tour of his home, which he named “Aspet.” Please note that none of Saint-Gaudens’ artwork is displayed within the home. The tours are limited to twelve people and is only viewable through a guided tour. However, visitors may take self-guided tours of the galleries and grounds. There is a free app for Android and Apple devices that is available for touring the park. The app gives guests audio information on historic buildings, major works of art, and images of Saint-Gaudens’ work. If you feel inspired, you can attend a sculpture workshop. This workshop is held on Saturdays from 1pm to 4pm. The workshop is geared towards novices and intermediate sculptors alike. Please note that reservations must be made in advance and a fee is charged for the workshop. There are many natural trails located here. The Ravine Trail is a quarter mile hike that takes you along Blow-Me-Down Brook and by a swimming hole which Saint-Gaudens constructed himself. The Blow-Me-Down Trail is just over a mile and leads you to the mill pond and along the edge of the ravines. Please use caution as the trails can be slippery when wet and are hilly in some places. Maps of all trails can be acquired at the visitor center. Need a place to park your Philadelphia RV overnight? There is a campground just seven miles away in Ascutney, VT.
Stop by Fretz RV before you hit the road this summer to visit historic sites, state parks, and campgrounds around the country. The service department at Fretz RV can make sure that your rig is ready for the road.